The Battle of Shanghai began on this date in 1937. It was the first major battle of World War II (the Euro­pean con­flict erupted two years later), and it even­tually involved nearly one mil­lion com­ba­tants. When hosti­lities broke out, Gen. Hajime Sugiyama, Minis­ter of War in the Impe­rial Japa­nese Army from 1937 to 1944, advised Emperor Hiro­hito (post­humously referred to as Em­peror Shōwa) that the Japan­ese Army would van­quish China “in about three months.” “We’ll send large forces, smash them in a hurry, and get the whole thing over with quickly,” Sugi­yama predicted. The “three-month war” con­tinued for eight years, one month, three weeks, and five days and cost 20 mil­lion Chinese lives, 15 mi­llion casual­ties, and created 95 mil­lion refugees. On the Japa­nese side, their armed forces suffered between 2.2 and 3.2 million casualties. Following Japan’s occu­pa­tion of Bei­jing (Peking) in July 1937, the Battle of Shang­hai began when Chiang Kai-shek’s numeri­cally superior National Revolu­tionary Army tried eradi­cating Japa­nese troops in down­town Shang­hai. In a bid to rescue their gar­ri­son, the Japa­nese launched amphib­i­ous landings north of the city and the two armies fought a Stalin­grad-type house-to-house battle, with the Japa­nese some­times em­ploying chemi­cal wea­pons, as other Japa­nese ele­ments gained control of the sur­rounding region. In the face of these flank­ing maneu­vers Nation­alist sol­diers retreated toward their capital at Nanjing (Nanking). The con­quest of Shang­hai, China’s second largest city, ended on Novem­ber 26, 1937, with a loss of 270,000 peo­ple killed and over 100,000 injured or missing on both sides. The fero­city and tena­city shown by the Chi­nese shocked Japan’s mili­tary leaders, who had hoped for a quick vic­tory for the 300,000 troops who had been en­gaged in com­bat opera­tions. The Battle of Shang­hai signi­fied not just some “inci­dent” against “ban­dits,” terms the Japa­nese expan­sionists had used pre­viously to down­play their country’s aggres­sion in China; rather, it opened a new chap­ter of all-out war between the two coun­tries (the Second Sino-Japa­nese War), a chap­ter rudely closed in August 1945 by a third party to the conflict (the United States) after it had incin­erated most of the aggressor nation’s major cities and wiped two more off the map. 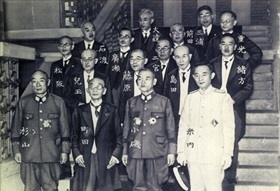 Left: Hajime Sugiyama (left in first row), as Minis­ter of War in the cabi­net of Prime Minis­ter Kuniaki Koiso (third from left in front row), July 22, 1944. (Koiso was Gen. Hideki Tōjō’s replace­ment.) In early Septem­ber 1941, on the verge of the war with the United States and Great Britain, Emperor Hiro­hito severely berated Sugi­yama for having pre­dicted in 1937 that the Japa­nese inva­sion of China would be com­pleted with­in three months, and he chal­lenged Sugi­yama over his con­fi­dence in a quick vic­tory over the Western powers—a classic case of les­sons not learned. Ten days after the sur­render of Japan, after finishing prepa­rations for the final dis­so­lution of the Imperial Japa­nese Army as dictated by the vic­torious Allied Powers, Sugi­yama com­mitted suicide by shooting himself four times in the chest with his service revolver. 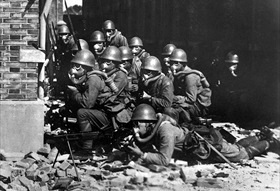 Right: Japanese soldiers wearing gas masks and rub­ber gloves during a chemi­cal attack in the Battle of Shang­hai (August 13, 1937, to Novem­ber 26, 1937). The Japa­nese Army fre­quently used chemi­cal wea­pons during the war in China. Indeed, sol­diers were autho­rized to use chemi­cal wea­pons on speci­fic orders of Emperor Hiro­hito himself, trans­mitted by the Imperial General Head­quarters through Gen. Sugiyama or another general on the Imperial Japanese Army General Staff. 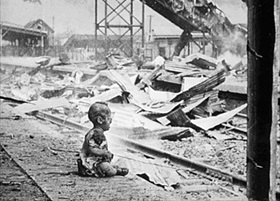 Left: This terrified baby was one of the only human beings left alive in Shang­hai’s South Rail­way Sta­tion after the Japa­nese bombed it on August 28, 1937. Taken a few minutes after the Japa­nese air attack, this black-and-white photo­graph, titled “Bloody Saturday,” was pub­lished widely in Septem­ber and Octo­ber 1937 and in less than a month had been seen by more than 136 mil­lion viewers. One of the most mem­o­rable war photo­graphs ever pub­lished, the image stimu­lated an out­pouring of Western anger against Japanese violence in China. 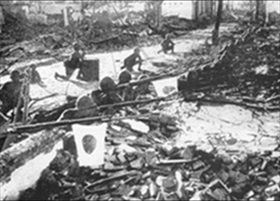 Right: Japanese troops in the ruins of Shang­hai, 1937. During the eight-year Second Sino-Japa­nese War (1937–1945), the Japa­nese mili­tary fielded 4.1 mil­lion men and en­joyed the services of 900,000 Chi­nese col­lab­o­rators. Facing the enemy were 5.6 mil­lion Nation­alist and Com­munist Chi­nese sol­diers. Granted its impre­cision, of the 1,130,000 Japa­nese sol­diers esti­mated to have died during World War II, 447,000 (or 39 percent) died in China.